BlogHome Blog News, Uncategorized, Wedding Planning Planning a Vancouver Island Wedding in 2016? Book your marquee tents now! If you’re planning a Vancouver Island wedding this year, congratulations! When it comes to wedding weather, the old adage is true: hope for the best and plan for the worst – this is the West Coast, after all! With an abundance of beautiful settings from beautiful sandy beaches to old-growth forests and everything in between – like your very own backyard –there are plenty of stunning Vancouver Island wedding locations. Here at Relay Event Rentals, we’ve helped make hundreds of weddings magical, and we know what it takes to make your wedding planning effortless. We know the wedding professionals you can trust, and we have all the supplies you need for a successful wedding. Including . . . Marquee tents to shield your wedding guests from all types of weather! 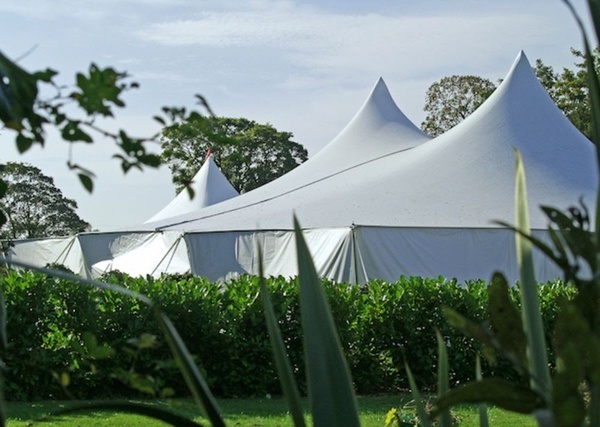 With an excellent selection of brilliantly white marquee tents, we’ve got your wedding covered rain or shine! Cleaned thoroughly after each and every use, our tents veritably gleam while keeping your guests shielded from the hot summer sun or soft summer rain. Plus, we deliver anywhere on Vancouver Island, set up and take down your tent. Our selection includes everything from small canopy tents to large, hexagonal marquee tents that shelter up to 100 seated guests. Our inventory, however, is limited. Reserve your tents early to ensure you have them for your wedding day! When you reserve your tent early, you may also consider . . . While we have a limited number of tents available to reserve for your special day, we have a nearly limitless supply of wedding staples like dishes, cutlery, chairs and tables. Plus, we have you covered with chandeliers, disco balls, specialty linens, a dance floor and much, much more! See our complete rental selection and price list. Give us a call at 250-871-4646 or email info@relayevents.ca to book your wedding tents and other wedding rentals today. If you prefer, stop by our showroom at 2-1255 McPhee Avenue in Courtenay, where you’ll always find our friendly, experienced team happy to help you plan the perfect wedding.